CHOBHAM locals were out in their droves to party while the sun shone on a glorious May Day Carnival full of Myth, Mystery and Legend. Celebrating the 28th year of the annual crowd-pleaser, the village was awash with colour as residents young and old lined the parade route in all manner of mythical costumes, from the packed High Street all the way through to the lively Recreation Ground. In keeping with the folklore theme, an army of King Arthurs and knights kept the ferocious fire-breathing dragons at bay, while queens and fair maidens looked resplendent in their finery. 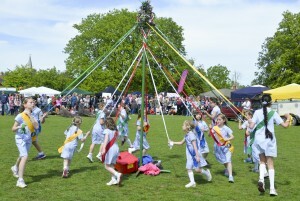 As well as the obligatory band of merry Morris and Maypole Dancers, death-defying circus act Vanders Double Wheel of Death (right) kept hoards of frolickers thoroughly feted on what was, mercifully, a sun-soaked rather than rain-drenched day. As well as raising village spirits in its own inimitable way, the popular street party raised vital funds for a host of worthy causes, including Neighbourhood Care and the Scouts and Guides.